We have seen some awesome sinks over the years, and at least one that was inspired by geology and topographical maps. The Ammonite washbasin from HighTech features a similar "organic" theme, but in my opinion, a much more captivating design. Apparently, Ammonites are an extinct species of cephalopods that existed about 400 million years ago, and their shells are prized by collectors. 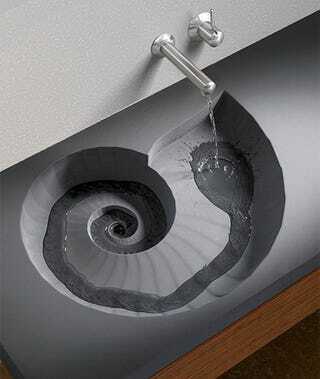 When integrated into a concrete sink, this prehistoric design creates a hypnotic spiral of water.